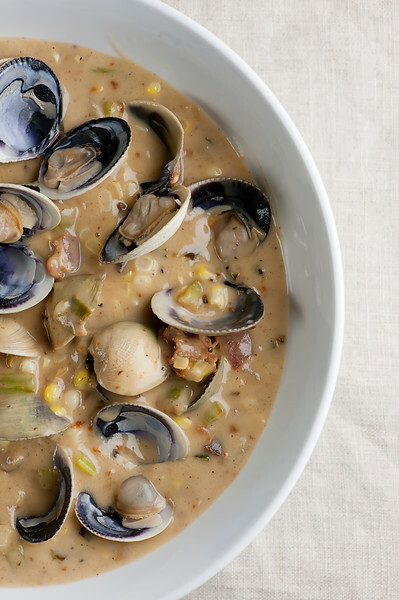 This easy recipe for bacon clam soup makes me happy on so many fronts. It has a creamy, dreamy broth that is just rich enough to make you close your eyes with satisfaction, and just light enough that you don’t feel weighed down. It’s chock full of fresh corn and bits of celery and scallions and chopped garlic. It’s swimming with perfect little clams. And if that wasn’t enough to convince you, it is laced through with crispy chopped bacon. If this isn’t soup heaven, I don’t know what is, and it takes less than 30 minutes from walk in the kitchen to ladling into your bowl. Let’s make it!Can I just pause for a sec and say, the inside of clam shells are so beautiful? That beautiful swirly blue pattern…nature is an amazing thing. 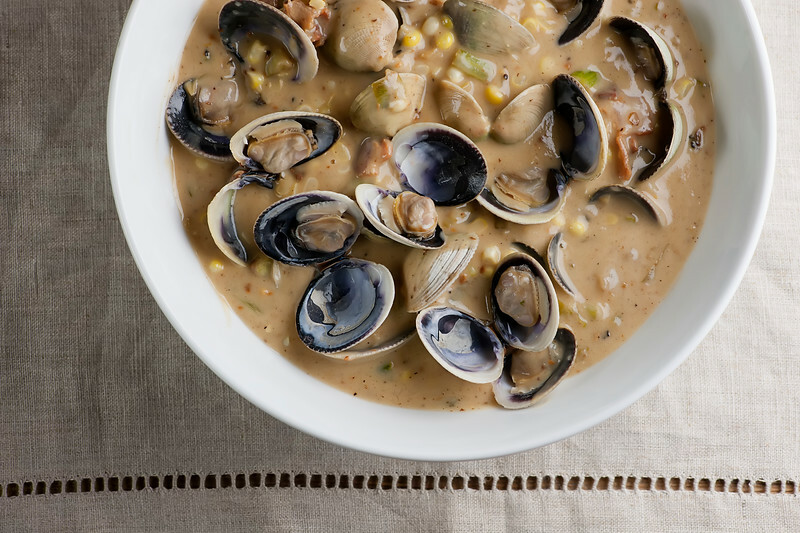 I go back and forth between using littleneck clams and cockles for this recipe…whichever my market has on hand that day is what I use. 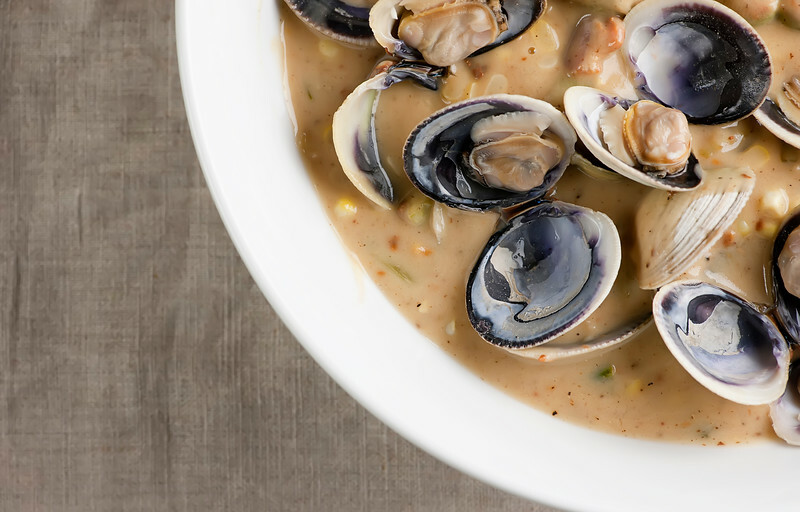 They are both smaller varieties of clams, and while I like leaving the whole clam in the soup, you can also take the meat out of the clam and discard the shells when you serve it…totally up to you. If you leave in the shells, just have a discard bowl on the table for the empties. Start by steaming up those clams in some water and white wine – it will take about 5 minutes for them to open (and toss any that don’t open). Scoop out the open clams and put them in a bowl, and strain the liquid through a fine mesh strainer into another bowl. Now cook up some chopped bacon in a deep pot until it is nice and crispy and scoop that out to drain on paper towels. Add the garlic, scallions and celery to the pot and cook them for about 5 minutes until they soften up. Stir in some flour, and then add that clam broth you saved. Simmer it for a few minutes until it starts to get just a little thick and then add a little bit of half and half. Stir in some fresh corn, the clams (either right in the shell or just the meat) and the bacon. Season things up with salt and pepper. And there you have it. Creamy, dreamy, bacon-y soup deliciousness. Happy sigh! Add 4 cups water and the wine to a large deep skillet and bring to a simmer. Add clams, cover and simmer until they are opened, about 5-10 minutes. Scoop out clams and put in a bowl, discarding any that haven’t opened. Strain liquid through a fine mesh strainer and save. Add bacon to a large deep pot and cook until crispy. Remove with a slotted spoon and drain on paper towels, leaving drippings in the pot. Add garlic, scallions and celery to the drippings and cook over medium heat until softened, about 5 minutes. Sprinkle flour on top and stir. Pour in clam juice and stir. Simmer until slightly thickened, and then add half and half. Add clams (either in their shells or just the meat), corn and bacon. Season to taste with salt and pepper and serve. The insides of clams are absolutely beautiful! Mother nature never ceases to inspire and awe! LOVE this soup, Kate! You really packed this one with all the deliciousness, but I love that you kept it light at the same time! I could totally get down with a bowl or 5 of this clammy bacony slurp-tasticness! Cheers, friend! What a beautiful looking soup Kate. Indeed this creamy, dreamy broth can make anyone happy. Love your gorgeous pictures. I agree… the inside of the clam shells are beautiful! And this soup? Yum! Lots of goodness going on here and you really can’t go wrong by adding bacon, can you ;)? This is a big bowl of comfort food and just perfect, especially as the weather cools down. Love it!